I, Ella Bell Abbott Fulks, was one of five children born from the marriage of Bruce and May Shay Abbott, Soldier, Kentucky. Soldier is located in Eastern Kentucky near the village of Olive Hill. That's where I lived until I reached age eighteen. During the 1920's, my entire family moved to Detroit, Michigan. During those times, Detroit had become a "boomtown." The factories there were producing automobiles in mass, and laborers were needed in large numbers. 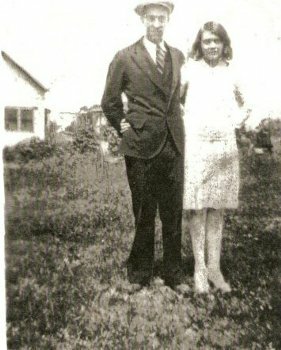 There in Detroit, I met my husband, Rummage Ira Fulks.Employed as waitress in a restaurant near the Ford Motor Company Plant, that was my first work experience as a wage earner. Waiting on people sitting at tables was a challenge. That kind of job can cause mental stress at times. I was subjected to different kinds of abuses- dealing with drunks, listening to foul language and dealing with loud and provacative people. Rum was part of my protection from trouble as a "bridge over troubled waters". He would enter the restaurant often to check on me and treat me well. Rum didn't appreciate those who did not respect ladies. Interesting to share with my children is that I weighed only three pounds at birth. Contributing toward my longevity(94 years) were my abstinence from smoking, avoiding the use of alcohol, and good physical and mental health. I stayed physically fit by working hard in the rearing of my children and with the labor necessary when growing up in "hard times." The work necessary for survival during those earlier time was an excellent physical conditioner. Not a spot of dirt was allowed was allowed to accumulate in our home when I was a child. 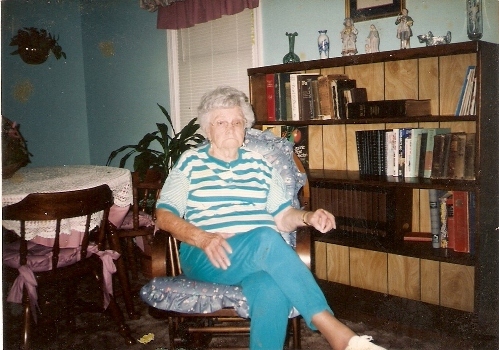 My mother, May Shay Abbott, taught me all the skills I needed to be a good homemaker. I always kept a clean house, and I taught all of my children the importance of these items. Caption/Rummage Ira Fulks and Ella Belle Abbott as they appeared during the 1920's in Detroit, Michigan. Residing in Grand Rivers, Kentucky following Rum's retirement from the U.S. Fish and Wildlife Service, we both missed the peace and tranquility associated with living and working on the wildlife refuge at Camp Cornelia near "The Great Okefenokee Swamp." Rummage was a good carpenter. He earned more from that trade than from eighteen years in the Civil Service. He was a fast and dependable carpenter and enjoyed that kind of work. After Rum retired for reason of disability, we moved from Southeastern Georgia and returned to Kentucky, the state where we were born and raised. Rummage began working in the building of cabinets and home construction. We didn't stay poor for long. I had all the time I needed to pursue the things I enjoyed. Unlike earlier times, I had most of the modern conveniences required to make homemaking easier. There were cooking, cleaning, just riding in Rum's automobile; and visiting friends and relatives. Sometimes we would take long vacations. Both Rum and I were good money managers. Fully schooled as a homemaker, those who were acquainted with me recognized my value as a cook and taking care of children, patiently and kindly. I could always maintain my composure and control my emotions. I had learned to control my temper and to be kind and patient with children. ( Rum was such a hard and dedicated worker that he had little time to handle discipline problems with our children.) When Rum or my children had trouble, I was usually able to "calm the storm." I never told my husband some of the things my children did. He would have thrown what is commonly called a "fit." 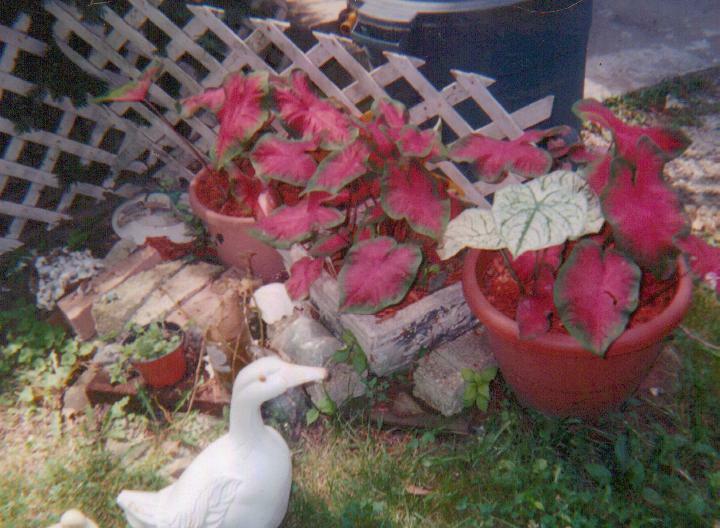 align=left> My son, George, did not give us very much trouble, but he never matured as well as we would have liked. He did work himself into his "pa JAM as", and so did my daughters. For the most part all my children showed good behaviors and judgement. As parents, Rum and I did our duties and helped the children then necessary. Image shows my daughter Martha Dorcas Fulks Hallman, Ella Belle Abbott Fulks, and my son-in-law, Norman Ray Hallman. 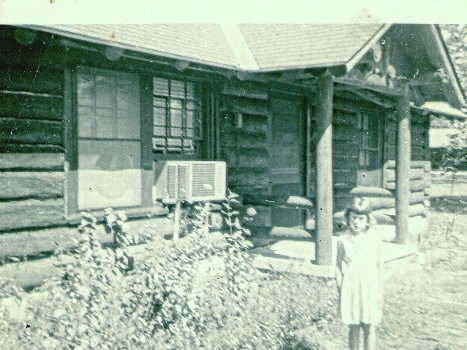 When my grandchild, Wanda Hallman, visited us at Camp Cornelia in 1956, she was not allowed outside without supervision. Huge, diamondbacked rattlesnakes were often seen on the premises. Once I gazed out the kitchen-door, and there was one near the steps. My son, George, snapped this shot of Wanda. You can see my silhouette in a window of our Camp Cornelia residence. (time line 1956) It was necessary that we watch every step we took there. For that reason, I was somewhat pleased when Rum retired, and we moved back to Western Kentucky. My parents, Bruce and May Shay Abbott had other children. 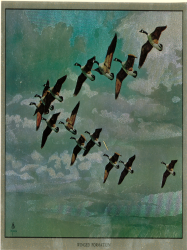 They were Kenneth, Elbert, Ottie, Eva, and Hilma. A World War II veteran and a combat infantryman, my brother Kenneth participated in the D-Day Invasion in Europe and continued to pursue the Axis Powers until the war concluded in 1945. Communicating with my brothers and sisters by letter for many years, we were lacking in both time and the financial means to visit my mother and father or brothers and sisters as often as we would have liked. Most of my immediate family resided in Eastern Kentucky and Indiana. Only in a few instances were any of them able to visit Rum and me. We did communicate by mail- frequently. I learned to read, write, and do arithmetic well in the schools there in Soldier, Kentucky. The teachers we had were very strict. If anyone said a word except during the oral recitations, a student would be severely punished. I did get a good basic education by working hard at school and behaving satisfactorily.As a child and young lady, I made many friends there in Soldier. 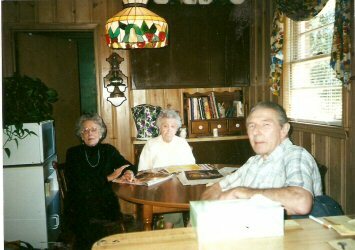 During the summer of 1947, Rum, I, and all our children visited my mother and father, Bruce and May Shay Abbott. Their Soldier, Kentucky home was located near the top of a mountain. 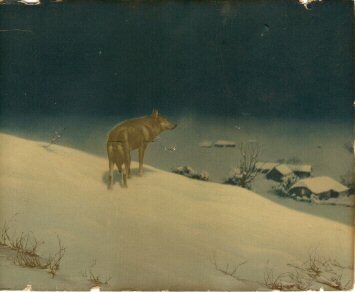 From that point, one could look down and see the town and far into the distance. Those mountains was mostly impassable but made a scenic view; the bluffs, boulders, meadows and forests. Soldier when I was a child was really a beautiful town, but slowly, it became rundown. Houses went unpainted, grass eroded from ground runoff, trees were removed for fuel. Among other things were open drains; causing the town to have a bad odor. Flies, mosquitos, and livestock roamed freely from unfenced lots. By 1940, Soldier was an unhealty undesirable place to live. 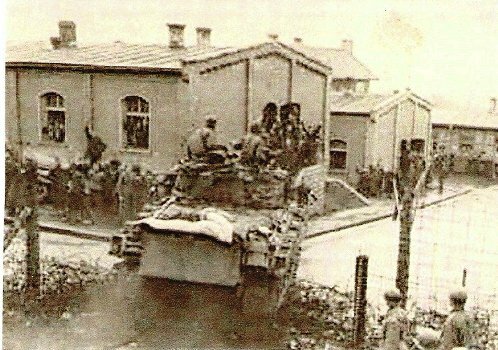 On the subject of World War II, my brother, Kenneth, was with Patton's 3rd Army during "The Battle Of The Bulge." He had participated earlier in the invasion of Normandy.Rum, I, and the children were still living in Kentucky. I listened daily to radio reports of those soldiers killed, captured, or missing in action. It was one day in December, 1944 that I was in the kitchen. Announced among a list of killed was a Kenneth Abbott. My heard fluttered, and I dropped the spoon I was holding onto the floor. "Oh, my God!" I shouted. The man killed with the name Kenneth Abbott was from a large city in Ohio. My Kenneth Abbott was from Soldier, Kentucky. The man killed in action was not my brother. A little- known fact is that both my mother and father, Bruce and May Shay Abbott, were nearly full-blooded Cherokee. That is the story passed down through time. They were to participate in "The Trail Of Tears", but had made friends with a wealthy officer in the U.S. Army. That officer agreed to care for the children. My greatgrandfather would return for his children if he and his squaw survived the journey to the land reserved for them in Oklahoma; They were never heard from again. The children left behind were allowed to work as servants on a large plantation in Virginia. They were freed at the same time as slaves and were given a land grant in what is now West Virginia. Evidence of this story is apparent from the skintint, jawbones, and other facial features typical for Native Americans. That was especially true in the case of my nephew, Jimmy Abbott. He was almost surely Cherokee with some European blood. 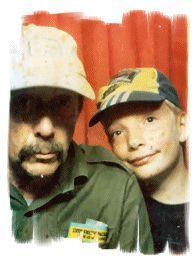 (My nephew, Jimmy Abbott, deceased during the 1990's. His premature death from lungcancer might have been associated with his use of tobacco and the breathing of industrial and coal dust.) Employed in Indiana, he survived in a hospital less than a week following the discovery of his illness. Assuming guardianship of my nephew and neice were my parents, Bruce and May Shay Abbott. Both Jimmy and Jeanette were my sister Hilma's children. Many years have passed since I have seen Ottie or Hilma, but we did communicate often by mail. Brother Kenneth and sister, Eva were more communicative. My son and I traveled from Fulton, Kentucky to Soldier, Kentucky by train for a visit with my parents, Bruce and May Shay Abbott during the 1950's. 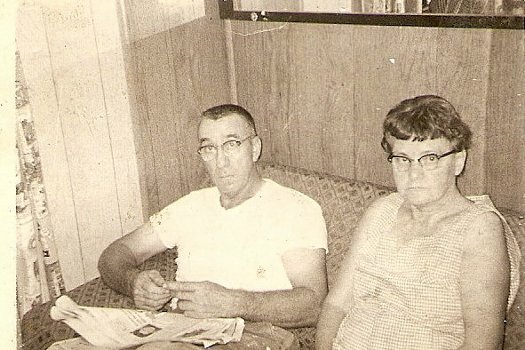 My nephew and neice, Jimmy and Jeanette Abbott were living in Soldier, Kentucky at that time with my mother and father. 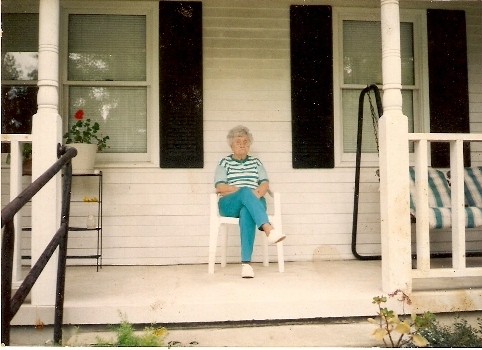 Ella Belle Abbott Fulks sits on the front porch of her home near Juliette, Georgia. (estimated year 2004)My last visit with my mother was September, 2006. Visiting her in an 18-wheeler, she was near her deathbed. It was necessary that she be assisted as she exited or entered her bed or to the toilet. She was able to speak and comprehend what she heard. She had lost interest in television and no longer enjoyed sitting on the front or rear deck. Having suffered a case of pneumonia, she was not able to recover fully from that disease. Mother was receiving oxygen and taking morphine for pain. She deceased soon after my departure, again by eighteen-wheeler. No celebration had been planned for my arrival or departure. 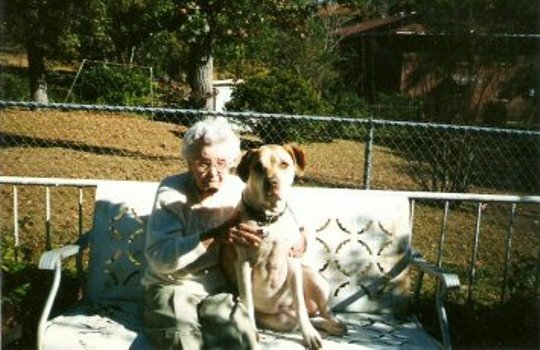 Ella Belle Abbott Fulks deceased on Sunday, September 17, 2006 at 3:20 P.M. Her body was flown from Macon, Georgia to Paducah, Kentucky two days later. 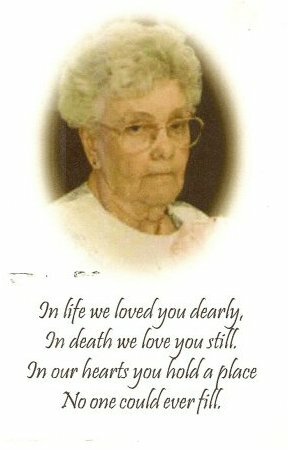 Her funeral was held on Friday, September 22, 2006 at 11:00A.M. Funeral services were conducted at East End Cemetary, Cadiz,Kentucky. .My husband, Rummage and I, moved from Western Kentucky and returned to live in Georgia(USA) in 1984. We were both in good health and wanted to spend more time with our grandchildren. 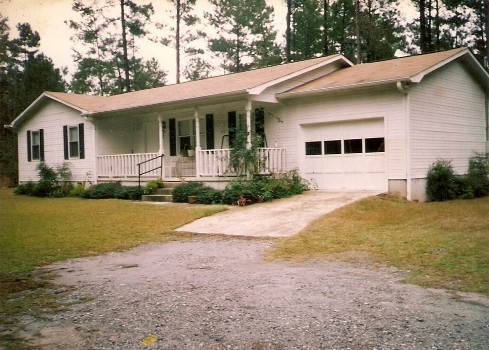 Another consideration was that land had been offered for sale as building sites in rural areas in Monroe County and near Juliette, Georgia. Land was cheap there at the time. We were able to buy fifteen acres for a fair price. Rum contracted to have a home built. He did not feel physically able to do the hard-labor associated with building construction. It was difficult for us to abandon our friends and relatives there in Lyon County, Kentucky. The friends we did have were more than two handsful, and their loyalty was unquestionable. We'd gone through some really "hardtimes" and "goodtimes" together in true fellowship. Those who were living were at Rum's funeral and mine. This photo shows my children and me in 1996. My husband, Rummage Ira Fulks, had deceased six years earlier. The Fulks are: (1)Euphama Fulks Jackson; (2)Martha Dorcas Fulks Hallman; (3)George Harold Fulks; (4)Betty Jean Fulks Garvin; (5)Ella Belle Abbott Fulks. Photo was snapped at the home of George Fulks in Harvel, Illinois. 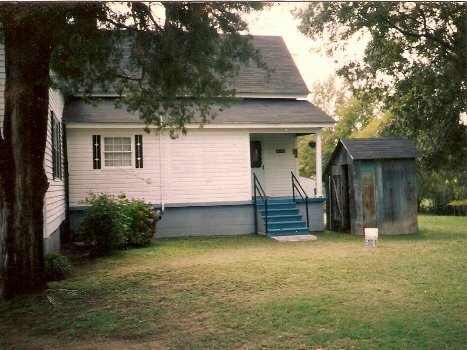 Constructed prior to the American Civil War is my daughter Euphama's home in Round Oak, Georgia. Elequent inside and well furnished in traditional Southern style, Euphama married Bernard L. Jackson in 1948. Situated on twelve acres of grass, pine, hardwood, and pecan trees, it is fitting for the outdoorsman that was part of Bernard's lifestyle. Our last home (as shown) was considered to be small. It was well insulated, heated by natural gas, and equipped with central airconditioning. We came far in our efforts to overcome the poverty we had known during earlier times. 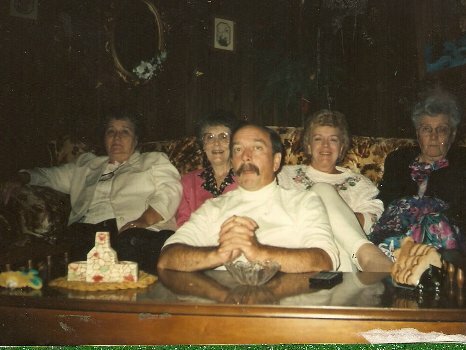 It was during the autumn of 1997 that Euphama, Dorcas, Betty, and I decided to visit my son, George, a resident of Hillsboro, Illinois. The four of us co-ordinated our visit to coinside with one of the annual reunions held among people who once resided in what is now "The Land Between The Lakes Recreation Area" located in Western Kentucky. We enjoyed our visit there to Illinois. I had the opportunity to meet some of my great and greatgrand children. Hillsboro is a city on a hill, and there is a multitude of beautiful famland surrounding that village. 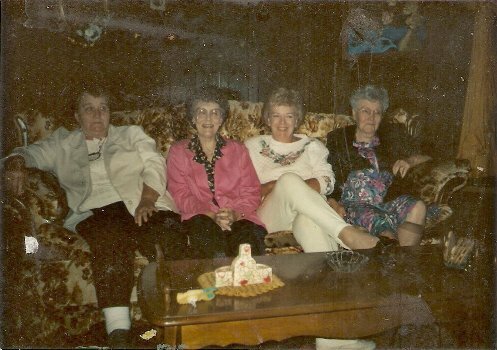 In the images shown below, are Tracy Denise Fulks, Euphama Fulks Jackson, Martha Fulks Hallman, and Betty Jean Fulks Garvin. My husband, Rummage Ira Fulks, deceased in the year 1990.
personal accounts of "The Lives And Time Of Rummage Ira and Ella Belle Abbott Fulks" are to be continued.